While Putin’s Russia runs roughshod over the sovereignty of its neighbors, his cultural emissaries are legitimizing his imperialistic aspirations in the West. Conductor Valery Gergiev is a personal friend of Vladimir Putin, having known Russia’s President since his notorious St. Petersburg days. Gergiev’s protégé, Anna Netrebko, is another loyal Putinista. Gergiev and Netrebko openly support the most loathsome policies of their favorite dictator: from oppressive anti-gay policies and invasions of neighboring countries to the annexation of Crimea and Russia-funded terrorist activities in Ukraine. The frowzy conductor managed to de-feather even the ageless “Swan Lake,” which the critics have bemoaned as “unmoving … akin to taxidermy: chilly, pedantic, curatorial, life-draining.” Gergiev’s critics are enraged not only by his lackluster performances, but also by the cognitive dissonance of an artist beholden to a dictator. Protesters intend to continue reminding Valery Gergiev and Anna Netrebko of their lost integrity every step of the way. This weekend, Gergiev is set to give two performances with the Mariinsky Orchestra at Ann Arbor, Michigan, where he will receive the 2015 University Musical Society (UMS) Distinguished Artist Award. Objections and calls to cancel the award will be amplified by the upcoming protests outside Hill Auditorium that will commence before the Mariinsky Orchestra’s Saturday night performance. Protests will accompany Gergiev’s and Netrebko’s joint performances in the U.S., including “Iolanta” at the Metropolitan Opera on Jan. 26, 2015. Artists and concerned citizens are determined to get their message across, having persisted as an unyielding thorn of conscience in Gergiev’s side for all of his American events. They took the time to explain what motivates them. “Last March the Russian government approved the use of military in Ukraine. Then the infamous open letter of support of those actions came along. Some of Russia’s prominent artists, musicians and movie directors signed that letter. What they supported has already caused thousands of deaths, hundreds of thousands of refugees, destruction of cities and villages. Millions of people have been living in fear and despair. It makes me sick to my stomach that people who openly and proudly support killings of thousands of people are being invited to perform at the world’s best concert halls and receive standing ovations from those who consider themselves a civilized society. Would Carnegie Hall invite an artist who openly says that the Holocaust was a great idea? Would the Metropolitan Opera collaborate with someone who wrote an open letter of solidarity with those who organized 9/11? Would American audience applaud those who share these kinds of opinions? But not only that. These artists used to perform in Ukraine very often. They were loved and praised by Ukrainian audiences. These artists supported war against those who adored them and waited for them to come back. They’ve supported the killing of their children, destruction of their cities. They’ve betrayed their audiences, spit in the hearts of those who wouldn’t miss their concert. “It makes me feel that I am not alone, that there are people who think and feel the same way I do, that they are ready to contribute their time – despite business and tiredness, sacrificing their comfort – to do something they believe in. These protests are also a message to my friends in Ukraine that I remember them. It is a way to show my support. I want to educate concertgoers. Many of them are not aware of political activities of the artists against whom we are protesting. I want to raise the awareness about the situation in Ukraine. I want to make these artists feel uncomfortable, to realize that no matter how much time will pass, I will remember what they did, and I will stay there, in front of the theaters and concert halls, and remind people about dishonest actions of these artists. I want them not to leave theaters with a triumph, giving autographs and collecting flowers, but rather running away. I hope that people will learn and hopefully will not buy tickets next time. I hope theaters and concert halls will think twice in the future before making arrangements with these artists. I wish the artists would think twice before making a decision to come here. 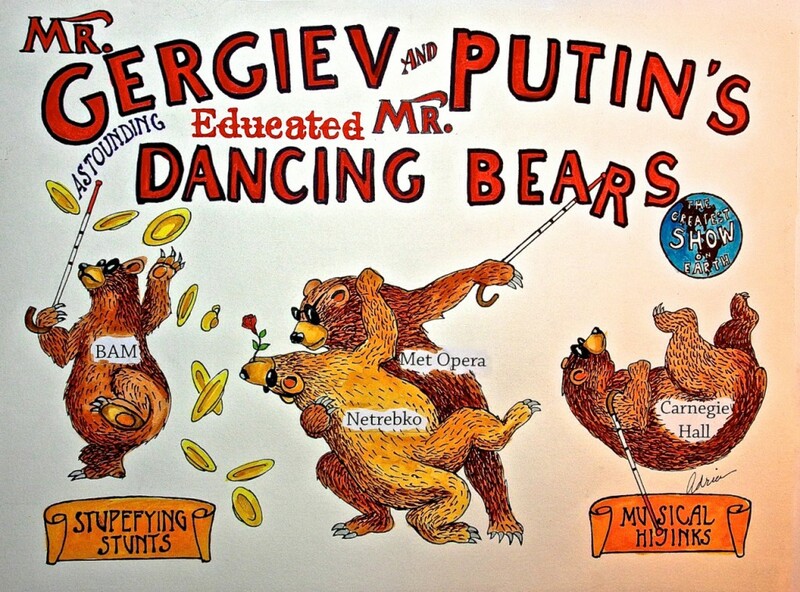 “A root cause of my protest of Gergiev’s appearance in NYC is not political at all. It is purely ethical. Gergiev signed a dishonorable letter supporting Putin’s Annexation of Crimea. He supported Putin’s aggressive policy toward Georgia. If an artist makes a political statement, he must be responsible for what he or she manifests, especially when it comes to invading another country. In this Gergiev has been rather hypocritical, never publicly admitting these particular political manifestations. I feel the urge to compensate this lack of knowledge announcing the above-mentioned Gergiev’s deeds to the general public. I just want New Yorkers to see that side of maestro. For me this protest is an opportunity to convey important message to the public and educate it using credible sources of information. This protest is the way to show support and solidarity with my compatriots in Ukraine. We also want to send a signal to the US institutions to stop inviting those who signed the official letter in support of annexation of Crimea. I also see the protests as our chance to explain to the institutions that invite these artists that they are providing a platform for supporters of war and aggression and that in that way, they are complicit in how these artists then use their reputation to promote war and aggression. With these particular artists and this particular regime, there is no separating art and politics. I want administrators and sponsors of these institutions to appreciate that by inviting these artists, they are putting a black mark on the reputation of their beloved institutions. I’d love to see US cultural institutions shut their doors in the faces of artists who carry Putin’s water. Of course, I am hopeful that as the patrons of these institutions find more about these artists, they will vote with their wallets and not attend the performances. I want the artists to realize that there is a cost to the choices they make. “On Monday January 26th, the Met Opera will unveil their new production of “Iolanta,” starring Anna Netrebko and Valery Gergiev. NYC Arts Managements have turned a deaf ear and a blind eye, as they continue to hire Russian artists who publicly parade their support for Putin’s wars, invasions, terrorism and his anti-gay policies … Tens of thousands of human lives, wholesale destruction of cities and countrysides, hundreds of thousands of refugees – all sacrificed due to Russia’s needless colonial expansion. When we hire propaganda mouthpieces like Gergiev and Netrebko or buy tickets to hear these artists, we in effect support these terrorist activities. Music is not hate. Music is not war. And since when is preaching war and terror, promoting intolerance and persecution is merely an “opinion”? Would our New York impresarios now have us “respect the opinions” of those who think the Holocaust was a great idea? Or “respect the opinions” of others who sign open letters of solidarity with the 9/11 terrorists? Would they now have us applaud anyone supporting Moscow regime’s persecution of gays? Famed composer Robert Schumann wisely said: “To send light into the darkness of men’s hearts – such is the duty of the artist.” Those who use their artistic talents to do the opposite must be prepared to face the music: literally and figuratively.